Joyce Yu, Founder of Instinctli, a brand which promotes health and wellness from the outside in. Johnson Wax Headquarters is the world headquarters and administration building of S. C. Johnson & Son in Racine, Wisconsin. 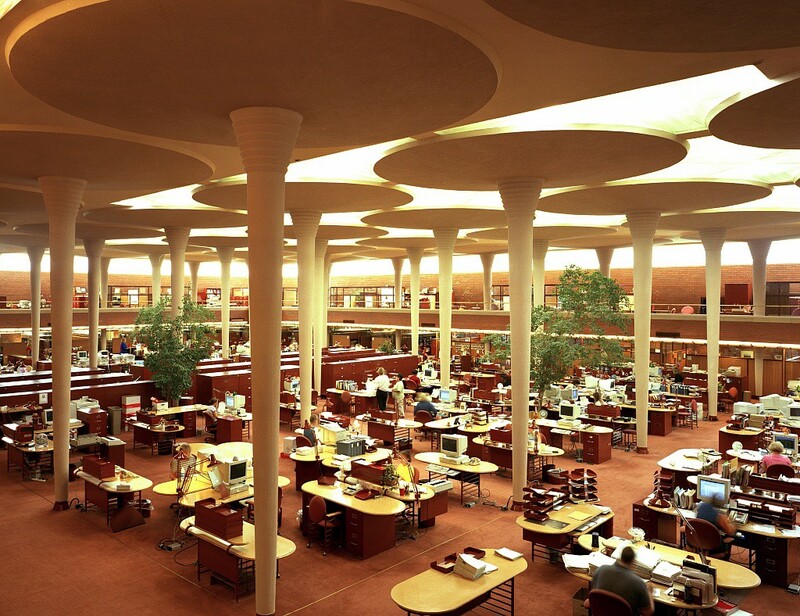 Designed by American architect Frank Lloyd Wright in 1939. Today it still looks very much the same as it did 75 years ago as it’s owners decided to preserve the unique beauty of the space. As you can see, the experience for each individual worker can vary! Healthy workplaces exude flow and freedom. They have a relaxing, breathable quality. The noise level signals activity, but the sounds are not distracting. If someone needs to recharge, there’s an option to go outside and connect with nature. The HVAC systems are designed with consistent airflow and temperature balance. The idea here is that people love to be grounded yet free. We thrive off of diversity. When our environment doesn’t support our human needs, well-being and innovation are compromised. Without innovation, an organization is running on empty. The graphic below is from Gensler’s 2016 U.S. Workplace Survey. Innovators are 5x more likely to have workplaces that prioritize both individual and group workspaces! This graphic is taken from Gensler’s U.S. Workplace Survey 2016. Having worked in multiple settings, I’ve personally noticed that I focus well in the light buzz of an open-plan office. In addition, I’ve found that I’m much more particular about cleanliness, abundant fresh air, and access to natural light when I need to get things done. Monday through Wednesday, my energy is non-stop and I thrive in an open-plan office setting. However, I often prefer Thursday and Friday to be softer, more social, and to learn something new on these days. Because I’m aware of my personal preferences, I try to plan accordingly. Of course I’m not always in control of my environment, but I’m aware of how I can control my setting. Awareness is the first step to proactively create a space which supports your best you. Question: What kind of space do you need to focus, collaborate, learn, socialize, and rejuvenate? How do you mix it up?